According to a study published in the Annals of Behavioral Medicine, people who made one small, change in their food choices and/or physical activity each week over the course of four months lost about four times more weight, compared with those who followed traditional calorie-restriction and physical-activity guidelines. Even if you only do it for a week, get a real picture of what you eat during a given day. This will help you identify more small changes! Make it easier on yourself by downloading an app that helps you track your food intake. Give yourself a “treat” day at some point during the week – maybe it’s Friday. Instead of indulging during the rest of the week, remind yourself that you’re looking forward to treat day and can wait for a favorite indulgence. 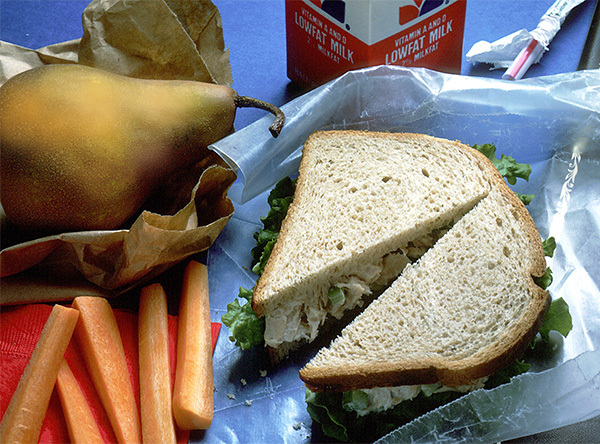 Resolve to pack a lunch two, three, or more times a week. Start with a frequency that is realistic for you. In addition to saving money, you’ll be able to manage the portion size and ingredients that can save you calories and excess salt, sugar and fat. At work, try giving up a few elevator rides per week for jaunts up the stairs. At home, do the stairs during commercial breaks if you’re watching a TV show. Swap one packaged food for a real food. Instead of a packaged granola bar, have an apple. Instead of a frozen pasta dinner, whip up real spaghetti with whole grain pasta. You can even freeze it and reheat it later! Remember, stick with one or two manageable changes to start, and then keep adding better habits over time.